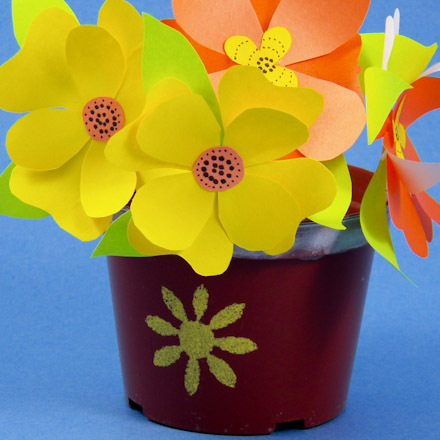 Turn a plastic flower pot from ordinary to extraordinary with stenciling. 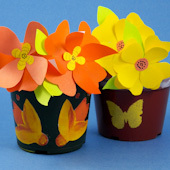 In this project, you will learn how to stencil a small plastic flower pot with acrylic paints. Use commercial stencils or make a stencil yourself using the printable stencil patterns included in the project. This technique can then be used to decorate large plastic flower pots, plastic hanging baskets, plastic wastebaskets, or just about any plastic container. 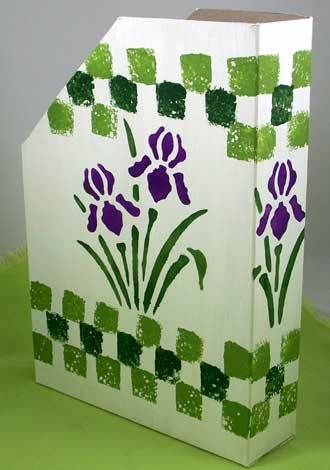 Related craft: Make a batch of greeting cards in a hurry with stenciling. Learn how in the Stenciled Cards tutorial. Thoroughly wash and dry the flower pot being careful to remove all grease and dirt from the outside surface. 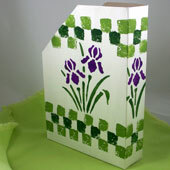 For the stencil, cut a rectangle of freezer wrap sized to fit your pot and the design you want to stencil. A rectangle about 3" by 5" will work for most small pots. Fold the rectangle in half with the shiny side of the freezer wrap on the inside. Draw half of a heart or flower shape along the fold. Other shapes that work well are leaves, stars and butterflies. Cut on the line you have drawn to cut away the center of the rectangle. 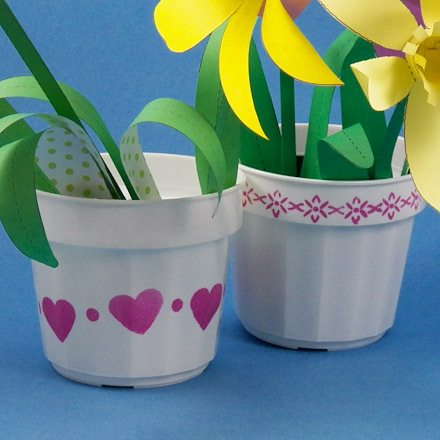 Carefully unfold the remaining paper and flatten the crease with your fingers. Tip: You can also download and print Aunt Annie's Simple Stencils pattern, Fancy Stencils pattern or Leaf and Flower pattern. To use the simple stencils or leaf and flower stencils, cut out the design(s) you want to use, place along the folded edge of the freezer paper, and trace the outline with a pencil. Or print the fancy stencils, and then cut out the stencil openings with a craft knife to make a paper stencil. Tip: Computer paper stencils can also be used. They last a few times or make them more durable by waxing the paper first. Tip: An easy way to make a stencil is with a paper punch. For a border, cut a 2" wide strip of freezer wrap with enough length to go around the pot or the pot's rim. Evenly space punches along the strip with a paper punch. Spray the back of the stencil with spray adhesive, following the product's instructions for a repositionable or temporary hold. Place the stencil on the flower pot, shiny side toward you. Rub your fingers along the stencil edges to ensure a good seal. Tip: You may want to tack the corners with masking tape for a more secure hold. Use an up-and-down dabbing motion to apply the paint to the stencil. Be sure to cover the entire cutout area of the stencil with paint. Carefully remove the stencil to avoid smudging the paint edges. When the paint is dry, you may apply the stencil again to repeat the design on other parts of the pot. You may need to clean the stencil with a paper towel between each use. Tip: If at any point you don't like the results, use a damp paper towel to wipe the paint off. Even dry paint can be removed with vigorous rubbing. 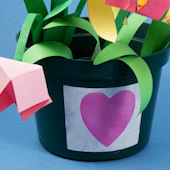 Tip: If paint bleeds around the edges, either too much paint was used or the stencil wasn't firmly adhered to the flower pot. Allow the stenciled design to dry thoroughly. For durability, apply varnish or sealer all over the outside surface. You can use a craft varnish like Aleene's Satin Varnish, a polyurethane varnish, or an acrylic spray sealer. That's it! Enjoy your decorated pot! Tip: More than one color of paint may be used on a single stenciled design—just be sure to let the paint dry, at least partially, between colors. 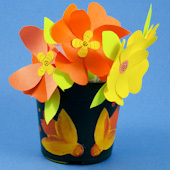 For a flower stencil, apply yellow all over, orange in the center and partway up the petals, and red highlights. A small paintbrush can be used to add further details to the designs. Tip: Use the designs in Aunt Annie's Simple Stencils pattern as stencil templates. Tip: A border stencil can be made by punching designs on a narrow strip of freezer wrap. Related project: Stencils can be used to decorate many items. See how to make this Magazine Holder from a recycled cereal box. Tip: On a dark-colored pot, stencil a white background first. It's easy to make a rectangle with strips of masking tape.